Christmas is sneaking up on us this year. The kids just finished school yesterday, on the 21st, and I had a packed day at work. Now, we are in full holiday mode, wearing pajamas and lounging by the fire. 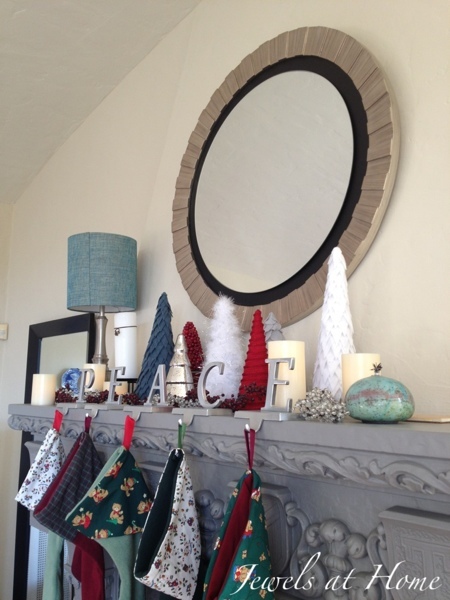 Just in time, I thought I’d share a peek at how Christmas decorating came together this year with a little house tour. I introduced a lot more silver and turquoise than in years past, and if I get time, I’ll post details on how to recreate the smaller details. 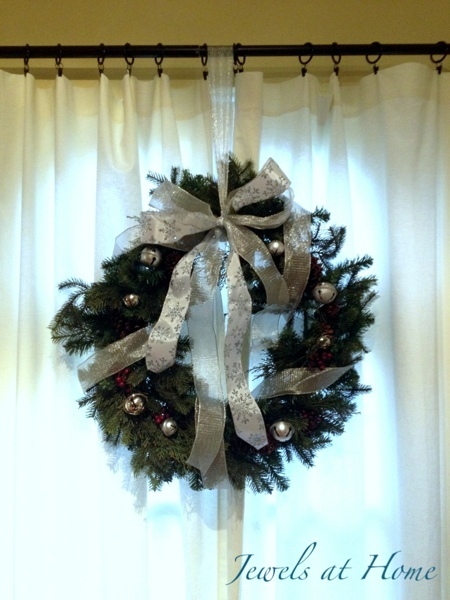 Come on in… starting with the front door, dressed up with a silver wreath and ornament door mat. 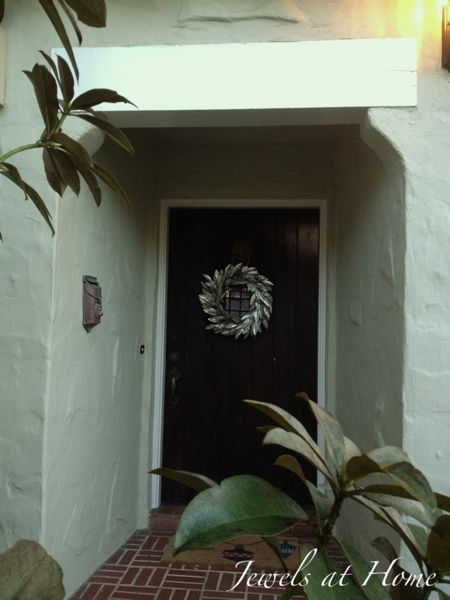 Silver wreath and a holiday doormat welcome you home. 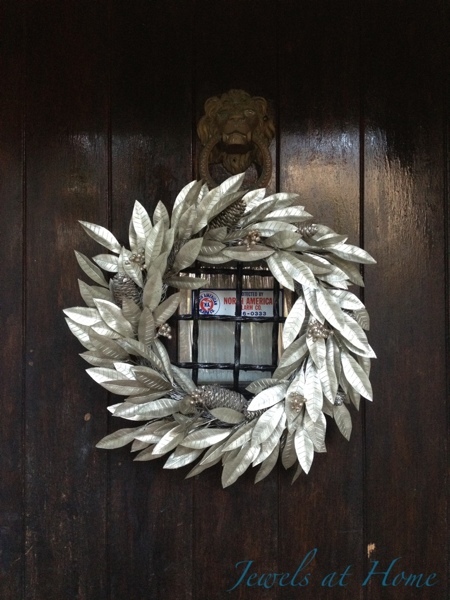 Silve wreath gives an elegant look to the front door. 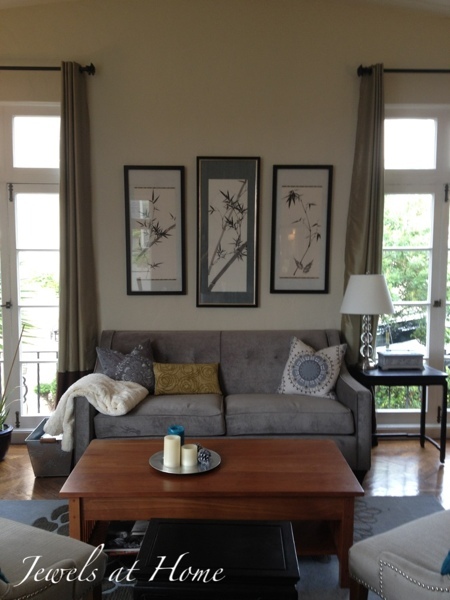 The mantel, repainted this summer, is also a centerpiece. I made many of the trees on the fireplace in this post and this one. Christmas mantel filled with homemade trees. 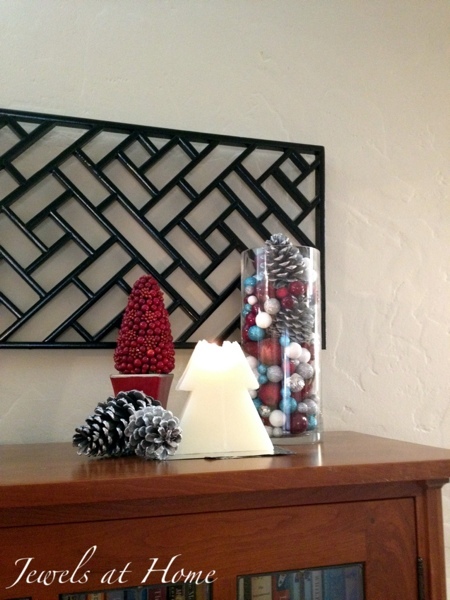 On the other side of the living-dining room, I added a tray with some candles and sprayed silver pine cones. 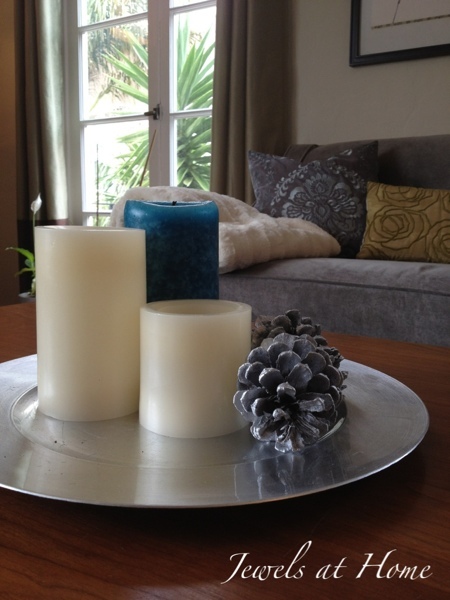 Simple winter coffee table decor. Another little Christmas vignette with trees and a wooden Santa puzzle my mom gave me years ago. 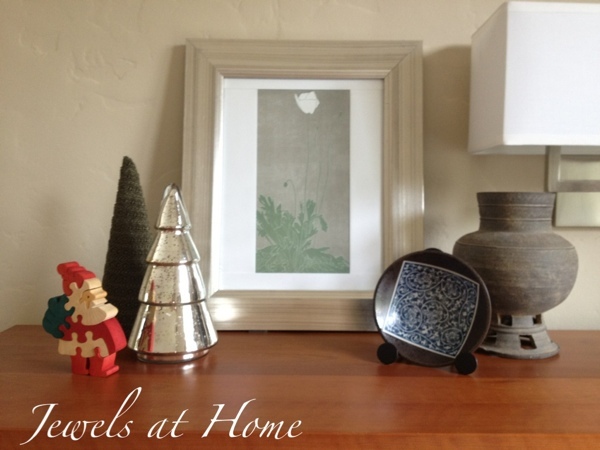 Christmas vignette with trees and a vintage wooden Santa puzzle. Christmas color is also in our foyer, with a wreath on our closet door and some accessories on top of the bookcase. 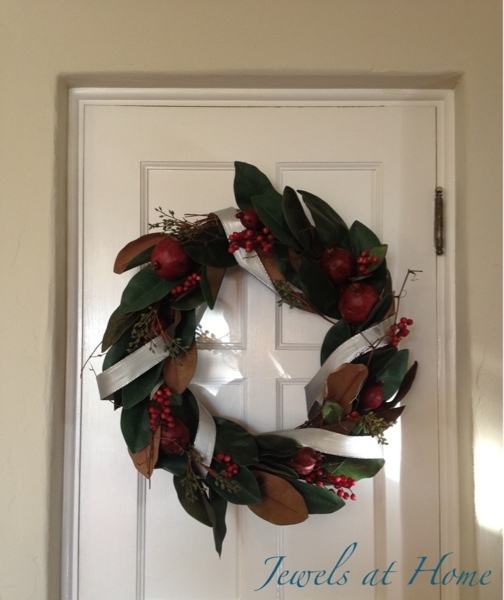 Simple magnolia and pomegranate wreath dressed up with silver ribbon. Silver, turquoise, and red accessories set the color scheme for this year’s Christmas. 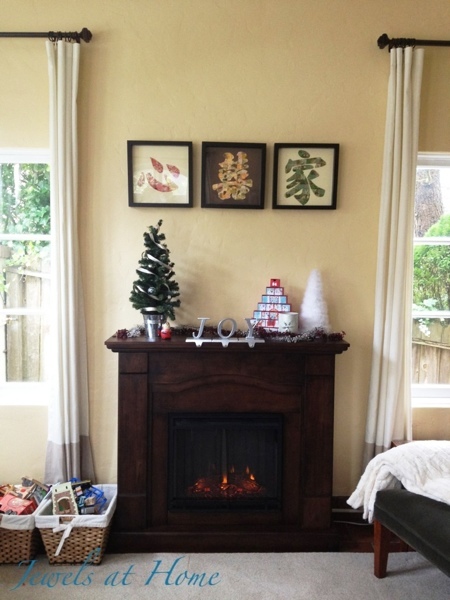 The wreaths over the big french doors in our family room connect the space to the outdoors, but the new fireplace keeps us cozy and warm. 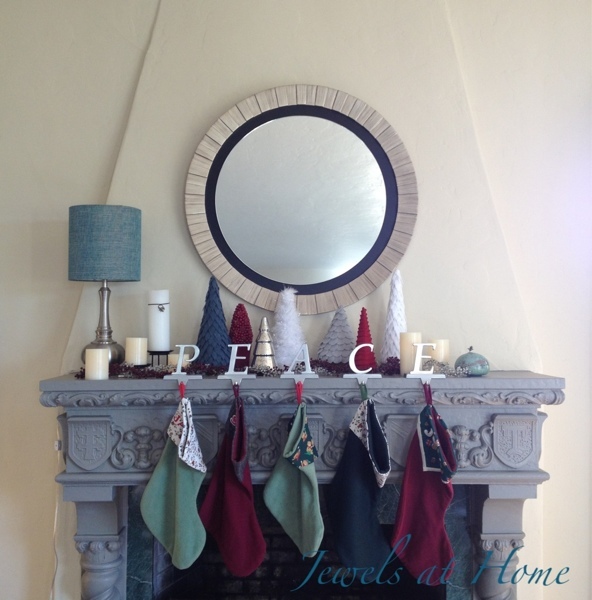 SImple Christmas mantel in silver, turquoise, and red. 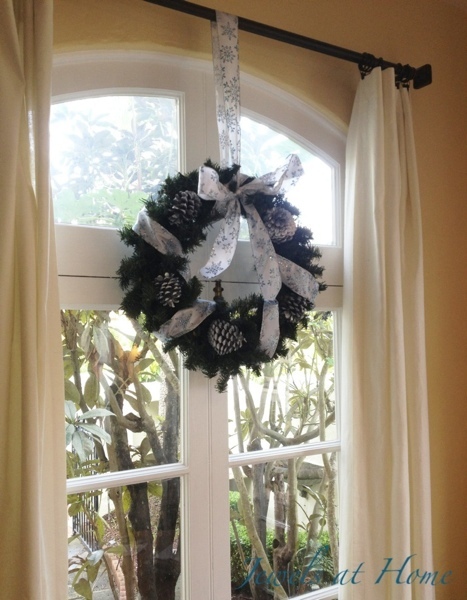 This wreath over a big french door can be enjoyed from the inside and out. 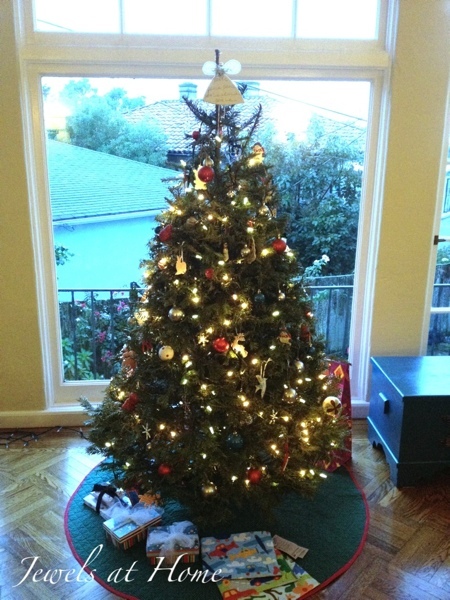 Finally, here’s our tree, with the DIY mercury glass look-alike and animal silhouette ornaments. I think it’s a bit small for the space but it really looked bigger at the lot, I promise! Steve and I have a gift-wrapping session/ movie night planned, so there will be lots more under the tree soon! 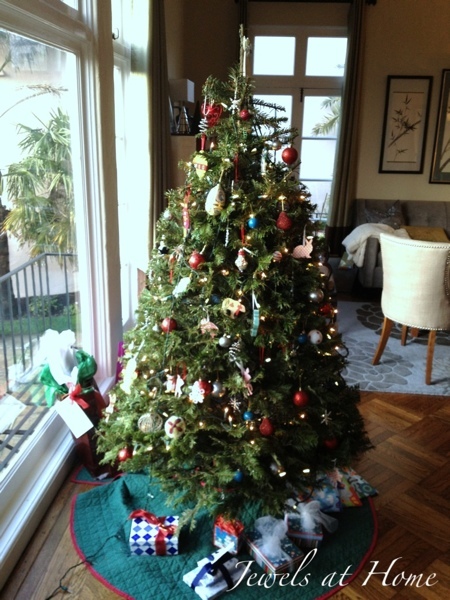 Christmas tree with red, silver, and turquoise. 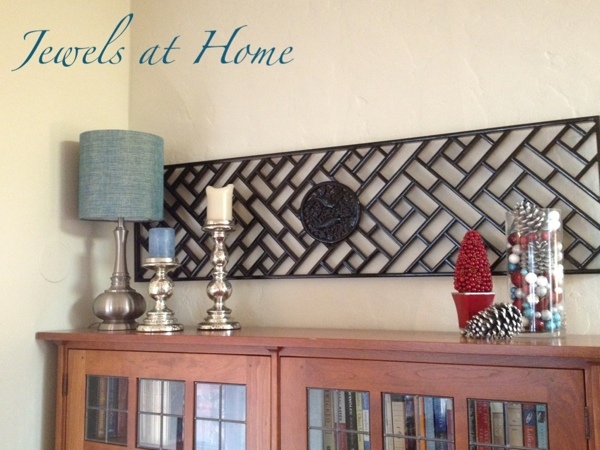 I hope you are also starting to unwind and enjoy being home for the holidays!